Nearly 1 inch (.96") has fallen today across much of Cookeville. Checking some other stations, I find .79" at the Emergency Mgmt. Office on Willow Avenue, .66" at Kittrell Hall (Rock Lodge) at Tennessee Tech, .94" out near Cane Creek, .71" in Twin Oak near Baxter, and just .32" up in Cumberland Cove near Monterey. Thunder is rumbling at 3 pm. 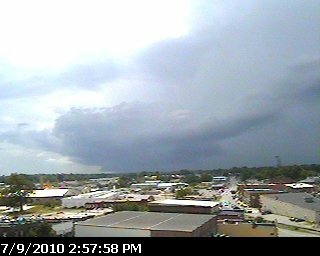 Note the very dark storm clouds just the northwest and west of Cookeville. Expect more storms in area now! Expect storms to develop during the day. Some of these storms could become strong to possibly severe today and early tonight as a cold front moves into our area. It is quite possible for us to see some locally heavy rain and minor flooding. Spotters are encouraged to report anything that reaches reporting criteria. We're expecting to only hit 85° this afternoon before rains move in. Low tonight in the upper 60's and lower humidity levels and a north wind will make our high of 87° on Saturday feel much more comfortable.